Developers of a new IKEA store in Jacksonville, Fla., wanted to make this project a model of sustainable, forward-thinking design. 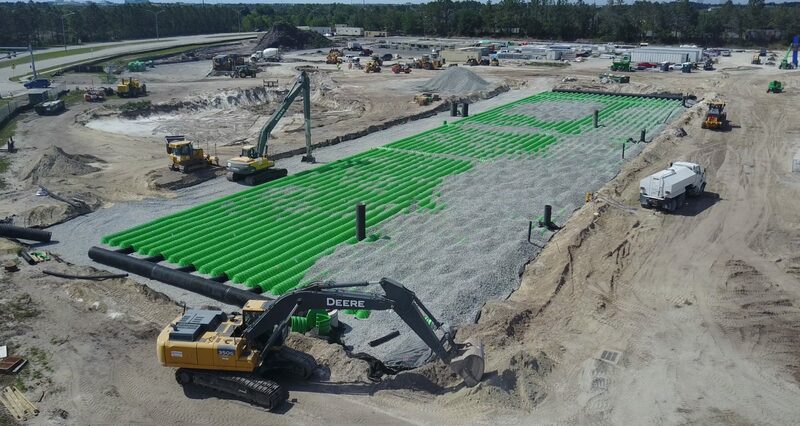 A big part of this plan was an underground stormwater management system that would be the largest ever installed in the southeastern United States. Along with the size of the installation, developers faced the task of coordinating runoff from a variety of sources into six separate basins around the building, while also meeting state and local regulations that required a minimum separation between the bottom of the chambers and the Seasonal High Water Table (SHWT). The area also receives heavy precipitation, so a robust, large-storage-capacity system was needed to manage runoff and protect the area’s nearby water sources. Although a competitive product had originally been specified for the project, Triton’s strength, variety of sizes and engineering convinced the developers that a change was warranted. Nearly 14,000 chambers were utilized, making this one of the largest Triton chamber installations in the United States. Because of the multiple drainage basins, and their placement relative to the SHWT, Triton worked closely with the civil engineer team and IKEA to create the most efficient and economical solution to manage runoff from parking lots, rooflines and unimproved lands. Because of the varied inputs of runoff, a multifaceted strategy was employed. The system’s flexibility allowed developers to utilize Triton’s Main Header Row to filter out sediments where necessary, but also allowed for direct inlets into the Triton distribution (storage) chambers when the runoff was relatively sediment-free (such as rooflines) without having to add costly manholes. After excavating the six drainage basins, geofabric was laid in each, and a bed of crushed stone was put down. Then the chambers and endcaps were installed. The developers used a combination S-29, C-10 and M-6 chambers on the project to achieve the specific strength and storage needs of each basin. The physical installation of the chambers took less than two weeks, despite the large number of chambers placed and the multiple installation sites. 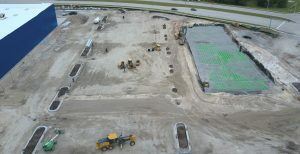 After the chambers and endcaps were installed, a crushed stone layer was put over all chambers to prepare the sites for final topping with pavement. 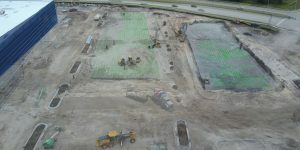 Because of Triton’s strength, variety of model sizes available, engineer support and storage capacity, the decision to switch from the originally specified system saved 7,217 square feet of land, required 1,237 cubic yards less excavation and 2,130 cubic yards less of crushed stone, while providing 3,032 more cubic feet of storage capacity. 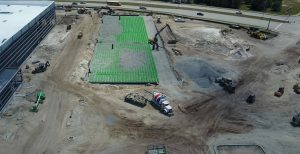 The Jacksonville IKEA stormwater management system created 259,000 cubic feet of storage, without compromising the local hydrology or eating up valuable retail and parking space. Triton M-6 Chambers were used in Basin 2, which relied on a combination of Main Header Row technology and direct input into the distribution rows to manage flows from parking lot drainage and roofline runoff.